From the changing seasons to the different stages of our lives, cycles exist all around us. These cycles are often influenced by numerous factors at each stage. 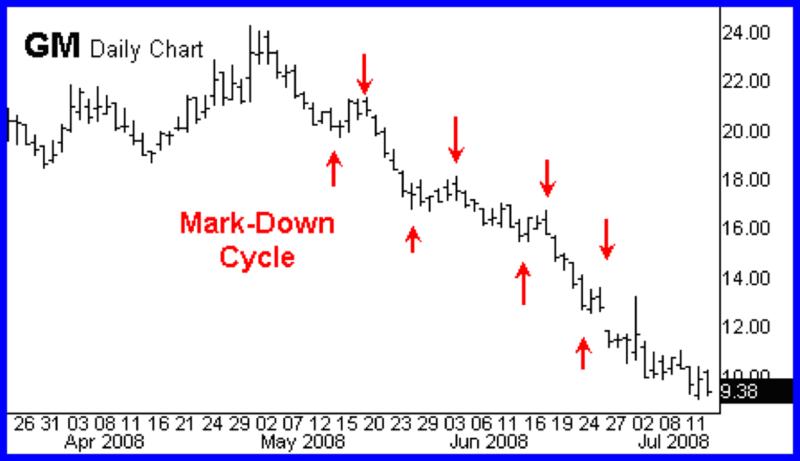 Likewise, cycles also affect the movements of stocks in the market. Understanding how these movements work can help a trader identify new trading opportunities and lower their risk. 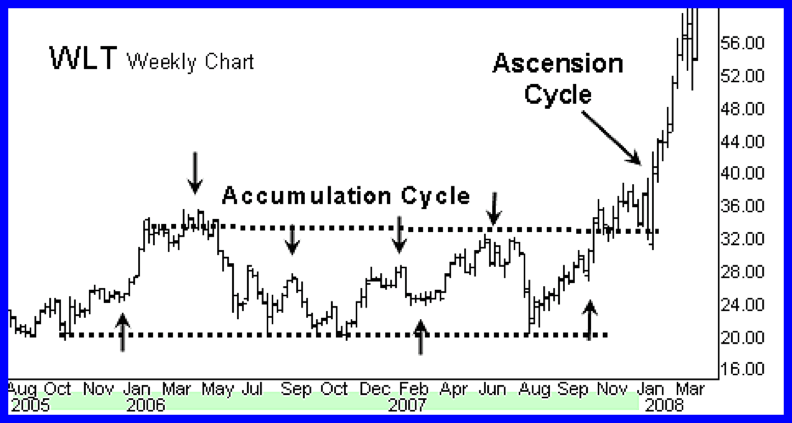 In this post, we are going to discuss the four stock market cycle stages that every trader should know. Let’s get started. The movement of prices in the stock market can often seem random and hard to follow. Prices may go up on certain days, and down on others. To an average person, these shifts are often confusing and the prices can resemble a casino game. 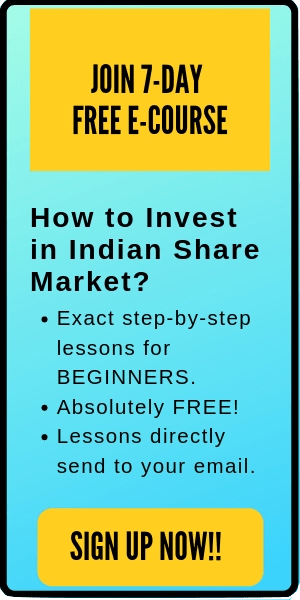 This phase of the stock market can apply to an individual stock or the market as a whole. As the name suggests this phase does not have a clear trend and is a period of agglomeration. The stock tends to trends at a range as traders accumulate their shares before the market ‘breaks out’. It is also known as the basing period because the accumulation phase comes after a downward trend but precedes an uptrend. The moving average does not provide a clear indicator at this point as the market is not following a particular trend. The longer the accumulation phase the stronger the break out in the market when the stocks start to trend. The accumulation phase may last a few weeks or a few months. So use this time to study the market and anticipate the right time to enter. The price range during this period is small and not particularly advantageous for day traders. It is advisable not to make large trades at this time until a market trend is confirmed. A current event in the economy can take stock out of this phase as you begin to see an uptrend. Once this accumulation phase is broken, you begin to see highs and lows in the market as we move on to the run-up phase of the market. Just as the accumulation phase is defined by its resistance to the changes in stock prices, the run-up phase is defined by the price going above this resistance level. The breakout of the accumulation phase results in a high volume of shares as the traders who remained silent during the accumulation phase aggressively purchase stocks. As this period progresses we begin to see a trend in the prices. The highs and lows in the market attract more traders as they begin investing. This result in an upward trend as the market becomes stronger and moves on to the next phase. This is the best time for a trader to make money. There is a lot of upward movement of prices which is great for momentum traders. Any downward trend during this period is not viewed as a bad thing but rather an opportunity to buy shares. When the market goes down, the shares will get bought up as the market begins to trend again. The run-up phase is best for swing or short-term traders. As this phase progresses, the volatility in the market decreases as prices move slowly every day. This phase, also known as the reversal stage, is when traders who purchased stocks during the accumulation phase begin to exit the market. 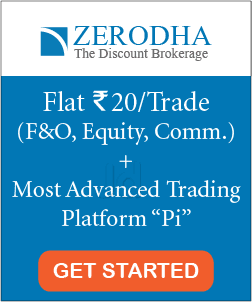 A prominent feature of this phase is an increase in the volume of shares but not in its price. 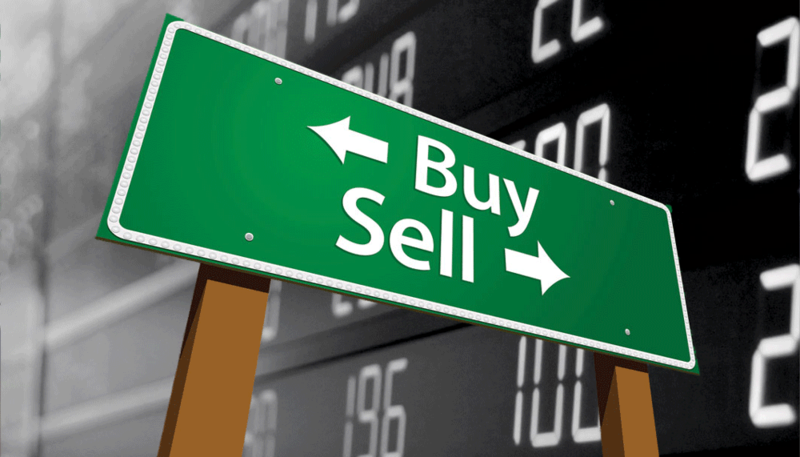 The market is usually bullish but the demand does not exceed the supply of shares enough for the prices to increase. There are usually hard sell-offs but not enough to make the market trend downward. There is a lot of volatility in the early stages as investors begin to pull out of the market which presents a good shorting opportunity as the market reaches the bottom it will bounce back with velocity. 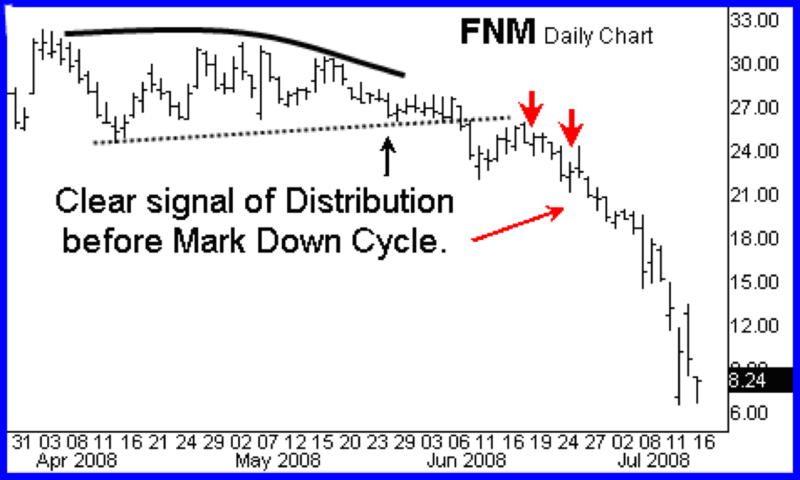 The distribution phase is identified through certain chart patterns like the head-and-shoulders top or bottom top. As the phase progresses the market starts to lose its volatility as a range begins to form. This is not the best situation for momentum traders. This is the last stage of the stock market cycle and is not a favorable time for most investors. Those traders who bought stocks during the distribution phase hastily try to sell as they are underwater on their positions. However, there are few buyers to meet the sale of shares. This lack of demand drives down the prices of stocks. If there are higher lows in the market for a long period of time, it signifies that the market is headed towards the accumulation stage. During this phase prices of stocks fall lower than expected so ‘don’t try to catch the falling knife’. A bear marker provides a good opportunity for long trades if the right strategies are used. It is important not to panic and sell during this period because these phases don’t last forever. 6 things you should NOT do when the stock market is Volatile! Is Stock Market Investing a Zero-Sum Game?